Original photo uploaded by @digimado. Update: A detailed top cut has been posted. December 5th, 2015. 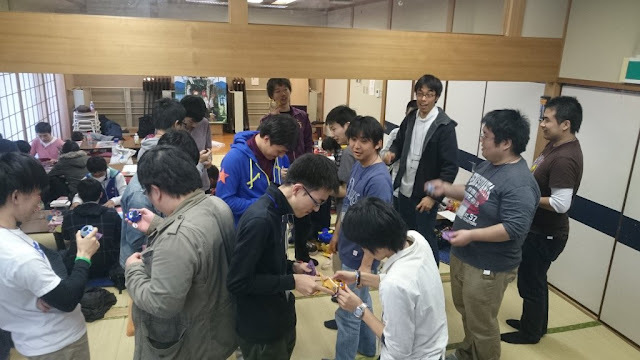 Today Japanese Digimon fan event organizer DIGIMADO hosted the end-of-year All Digimon Cultural Exchange, a combination meetup and tournament series revolving around the various Digimon games. The Exchange was scheduled a month in advance, and registration was coordinated over the TwiPla event scheduling site. Although preregistration numbers were at a low of 27 out of their 55-person cap, a significant number of walk-ins lead to more than 40 persons joining in. 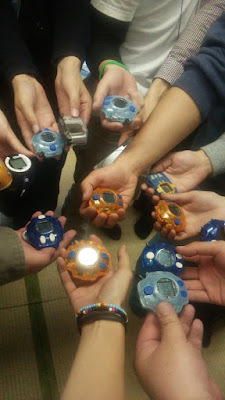 A record high of 18 people participated in the Digivice & virtual pet tournament; fans at DIGIMADO are usually drawn to the video game and trading card events instead, and the increase in participants likely reflects new interest following the premiere Digimon Adventure tri. Incredibly, one tamer using a Patamon DigiBat figure made it to the tournament finals, taking down multiple Digivice Ver. 15th opponents like Metal Garurumon and War Greymon. The DigiBat figures normally connect as if they are an Agumon on a Digital Monster Ver. 1, with one of the most middle-of-the-ground power levels of any Digimon. Usually the DigiBat toys are used as punching bags to rack up a high win ratio on the virtual pets, but in today's DIGIMADO tournament the bags punched back. The top 4 included a Patamon DigiBat, a Digimon Pendulum 5.0: Metal Empire pet, and a Digivice Ver. 15th. The tournament was ultimately won by Sorakichi (@soraki_t) partnered to Omegamon on his Digivice Ver. 15th. Sorakichi was awarded with a Digmon plush toy for making first place. The 18-person tournament included at least 9 Digivice Ver. 15ths, 2 DigiBat toys, 1 Pendulum ZERO, and 2 Pendulum Progress 1.0: Dragon's Roar virtual pets. The previous Digivice tournament was won by Gerumon, partnered to Jesmon on the Digivice Ver. 15th. 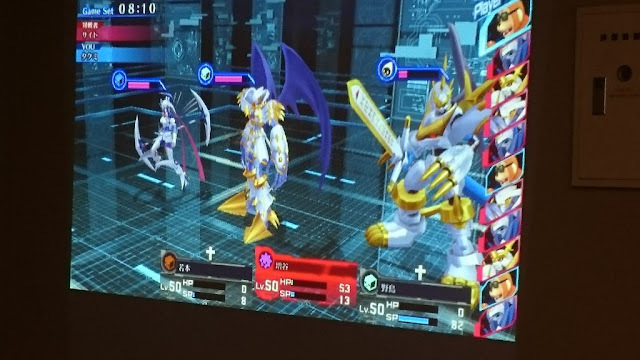 The DIGIMADO Cultural Exchange also included separate competitions for Digimon All-Star Rumble, Digimon Story: Cyber Sleuth, and the Hyper Colosseum Digimon TCG. 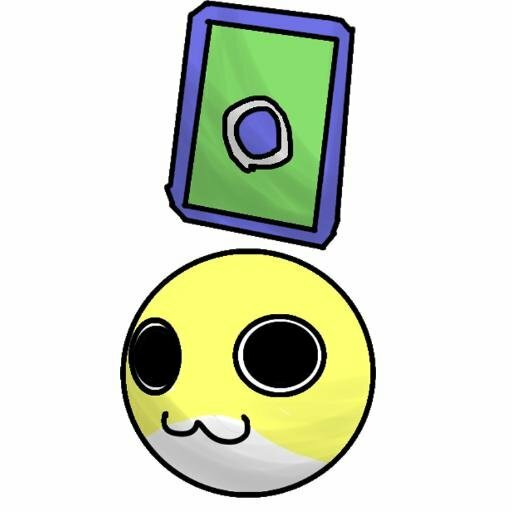 The winner of the Hyper Colosseum tournament was Butterscotch, playing Lucemon Falldown Mode; second place played Matadormon, one of the most popular decks in the metagame. Original image uploaded by @digimado. The exact details of the Digimon Story: Cyber Sleuth tournament are still yet to be published. The tournament finalists' in-game names were Saito and Takumi; Saito won the tournament using Dianamon, Dynasmon, and Imperialdramon Paladin Mode. Takumi's exact party is unclear, but it's known that his last Digimon standing was Etemon. Although most tamers use fully evolved Ultimate Digimon in Cyber Sleuth's multiplayer, some Perfect-level Digimon like Etemon and Aero V-dramon still see play because of their lower memory costs and skills on par with Ultimate Digimon. In Etemon's case, his Reinforced Monkey Suit reduces all physical damage by 15% for the entire party, and his Love Serenade is one of the rare piercing attacks in the game that ignores defensive stats, while dealing damage to the entire opposing party equal to his Intelligence. All Digimon were automatically scaled to level 50 during the tournament, and tamers were restricted to a party size of 150 memory maximum, with no more than 11 Digimon in total. Each tamer was allotted fifteen minutes per turn to make their moves in, and only one Digimon could have healing or restoration skills, limiting the defensive options available. Saito's team was structured around passive buffs; Dynasmon and Dianamon's Support Skills respectively boost Fire, Light & Water damage by 10%, while Paladin Mode's Support Skill reduces incoming damage by 10% if the opponent has an attribute advantage. Saito's Dynasmon also helped get around the healing restriction with its Dragon's Roar Special Skill. Dragon's Roar restores Dynasmon's HP equal to 50% of the damage it deals, and its damage is already boosted 10% by his Support Skill in addition to hitting twice. Layered over several turns, this has the effect of mitigating damage dealt to Dynasmon. A secondary focus of his team was status effects, which are very powerful in Cyber Sleuth due to immunity only being possible through specific attachable items. 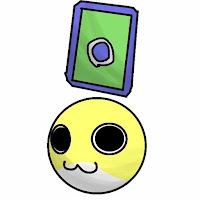 Dianamon's Goodnight Moon Special Skill always inflicts the Sleep status effect on its target, effectively taking them out of the battle unless the opponent spends a turn trying to recover the status, by which time another of their Digimon will likely be asleep. Dianamon also ranks very highly in Cyber Sleuth's Speed tiers, second only to Lord Knightmon and Ulforce V-dramon, giving her more turns on average to inflict Sleep in. DIGIMADO (デジ窓 "Digi Window") is the de facto lead organizational force in the Japanese fandom since Odaiba Day 2009. Their formation was prompted by the demise of Bandai's official systems of organized play for all Digimon card games in 2008. In addition to hosting fan gatherings for the virtual pets, video games, and card games, DIGIMADO also puts out occasional podcasts in Japanese. Fitting its origins as a TCG event organizer, DIGIMADO's mascot is Cardmon C1, from Digimon World 3: The Door of A New Adventure. Participants in DIGIMADO events usually go by their Twitter handles, rather than their real names. Western Digimon fans have begun to emulate DIGIMADO, beginning with the Digimon Celebration event series founded by the Digimon World Tour organization. The first Digimon Celebration will take place in Pittsburgh on February 6th, 2016, four days after the North American launch of Digimon Story: Cyber Sleuth.